I received the eARC of this book from NetGalley in exchange for a honest review. 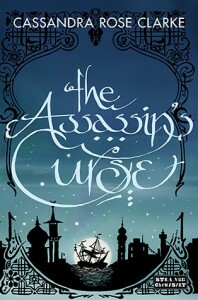 Assassin's Curse opens with our heroine, Ananna, fleeing a arranged marriage in a camel. Yeah, you read it right, a camel. 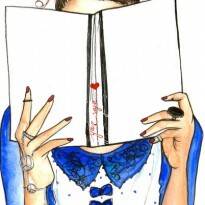 That's was the first time on this book that I said to myself: I like this girl. She's my kind of girl. Ananna is a pirate. Her parents and her supposedly future husband are all pirates too. As are her future in-laws. Because she fled, now she has to deal with an assassin sent by her betrothed parents. This is no ordinary killer, but a mythical one belonging to a mysterious and much feared order. A magical order of assassins, who's horror stories Ananna's grew up hearing about. When said assassin catches up to her, something happens and she ends up saving his life. This jumps starts a curse and now the assassin needs to protect her, otherwise he suffers a lot of pain. The pair then teams up to defeat the other assassins who will be coming after her, since he failed, and to find a cure for the curse. And so the adventure begins. A trek through a dessert to find a river witch. A sea voyage in a pirate ship to reach some magical islands. And a growing attraction between our intrepid heroine and the scarred assassin. I hadn't had that much fun reading a book in a long time. It has this Arabian Night's feel to it. This great Middle Eastern world and influence, that the only thing missing was a magic carpet. And the magic here is one of the coolest I've ever read about. Ananna is a terrific heroine. She's courageous, loyal, smart, capable, cunning and full of sass. It has been ages since I liked a heroine as much as I liked Ananna. There isn't any TSTL moments with her. Not once in the whole book I got annoyed with her. I have to say that was extremely refreshing. I was sold on her after just a few pages, but reading the whole book made my appreciation for her to only grow. What I also loved about her was that she wasn't beautiful and perfect. She had a real woman's body and she even says in the book that she has never been considered pretty. Plus, she is very adamant that she doesn't trust beautiful people, because everything is easier for them and they don't have to work as hard as everyone else. The love interest, Naji, is also a compelling character. Half of his face is completely scarred and he's extremely mysterious. He can't divulge the assassin's order secrets and he's now cursed to save a girl he was suppose to kill. Her kindness and loyalty moves him and an interesting friendship develops between the two. I thought the author did a fantastic job with the romance here. It's slow building and by the end of the book you only know how one of them feels. There is no insta-love, thank heavens. What we have in this novel is a realistic relationship development with two people getting to know each other, and a girl finally finding out that she wants more than a friendship. I was also glad that the leading man here is less than perfect, especially physically. I'm kind of sick of all the beautiful alpha males we find so often in this genre. I wish authors would give me an ugly and/or disfigured love interest more often. But, the only cases I can't remember now are on this book and on Stacia Kane's Downside Ghosts series. I wouldn't call this novel a romance, because it's not. It actually crosses over many genres. It has a little tiny bit of romance, but it could also be considered YA (since the heroine is 17), Fantasy (it's a magical universe), and even a little bit Steampunk (landships and all). The classification really doesn't matter, what matters is that this is a fantastic read. I would recommend this to anyone who would listen. It's such a fun-filled adventure in such a magical universe, that's hard to imagine anyone not enjoying it. It's very original and refreshing, especially since in this genre that is becoming so repetitive. So, go pre-order this book now and read it the day that it comes out. You won't regret it.